Without an organization to urge his claim; without a campaign fund to circulate literature in his behalf; without patronage to bribe a single voter; without a predatory corporation to coerce its employees into his support; without a subsidized newspaper to influence the public mind. The Republicans are busily putting together a vast war chest, subsidized in no small part by J. P. Morgan and other monopolist lions of business, all to put the man they are certain will be their obedient puppet into the White House. Is it any wonder the Great Commoner was trounced over and over in his presidential bids? Connie, December 13 1936, courtesy of Cole Johnson. Somewhat dismayed, the young man hustled upstairs and found the story to be true. Then he applied for work at another newspaper office, obtained a chance and was promptly fired. This seemed discouraging, and he thought he would try another climate—Philadelphia, for instance. So he stepped on a train to the Quaker City and tackled the Philadelphia Times. Sure, he could have a chance; commence right off, said the Times people, and breathing a prayer of thankfulness Gene Carr grabbed a pen and a sheet of nice white board. He finished his picture, turned it in, and went to his lodgings, happier than words can tell. He woke up to find the Phila- [text missing] of existence, vanished off the face of the earth. After thinking over the situation a few minutes Carr decided that if he really was a second Jonah—and of this he had little doubt—he would make a record as such. If be was going to bust everything he came in contact with he’d bust something worth while. So he came back to New York, picked out what was at that time one of the largest and most prosperous papers in the country, and got another job. But his luck had turned. The paper didn’t “bust,” and Gene Carr just kept on climbing. Exploits of “Lady Bountiful” Will Be Pictorially Pet Forth in Vaudeville Offering. 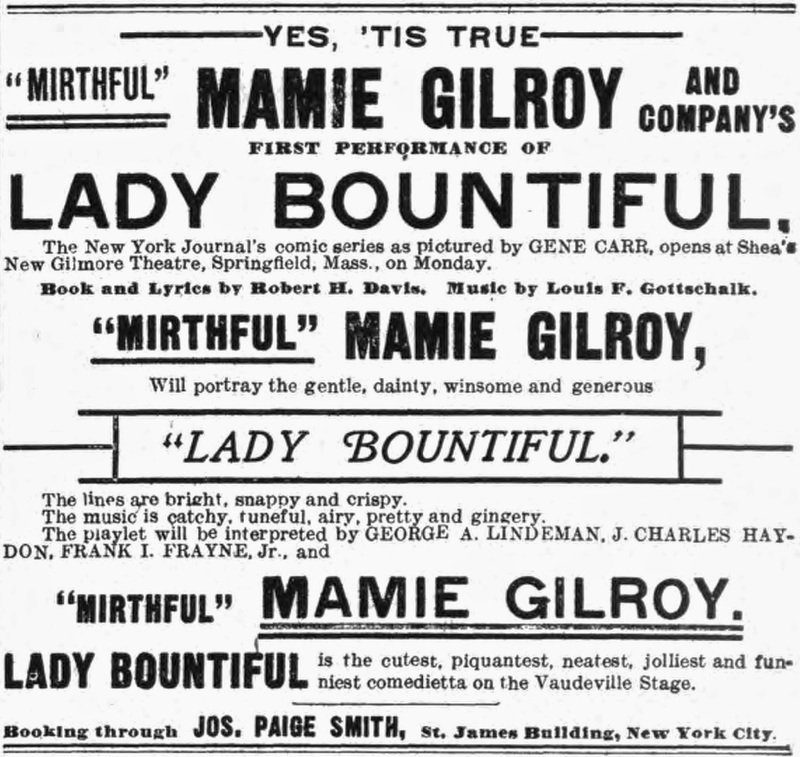 Miss Mamie Gilroy believes she has obtained a great subject for vaudeville in the exploits of “Lady Bountiful,” which have been set forth pictorially in the columns of an evening newspaper by ’Gene Carr, the artist. The actress thinks there will be much comedy in the misadventures of the heroine trying to do good to gamins of the street. Robert Davis is writing the sketch, while to Louis Gottschalk and Jean Schwartz has been assigned the task of composing suitable music to accompany it. Miss Gilroy will be supported by a small company. Lady Bountiful Bride of Mr. William Harrison. Model for Gene Carr’s Famous Sketches Weds a Young Broadway Business Man. Lady Bountiful as Gene Carr Made Her, with His Sister as the Model. A pretty wedding took place at St. Augustine’s Church, One Hundred and Sixty-fifth street, Bronx, to-day. Rev. James McGuire performed the ceremony. The contracting parties were Miss Irene D. Carr and William Harrison, a prominent young Broadway business man. The ceremony was of more than passing interest, both from the beauty and social standing of the bride and the fact that by it the original of the “Lady Bountiful” sketches was made a matron. After the ceremony, at which Gene Carr acted as best man, there was a reception at the residence of the bride’s parents, No. 1239 Tinton avenue, Bronx. Mr. and Mrs. Harrison left for a trip to Atlantic City and the South. Some of his daily cartoons and comics for The World, from 1903 to 1011, were All the Comforts of Home; Handy Andy; Home, Sweet Home; Mr. Al Most; Mrs. Nagg and Mr.—; Phyllis; and Willie Wise can be viewed here. 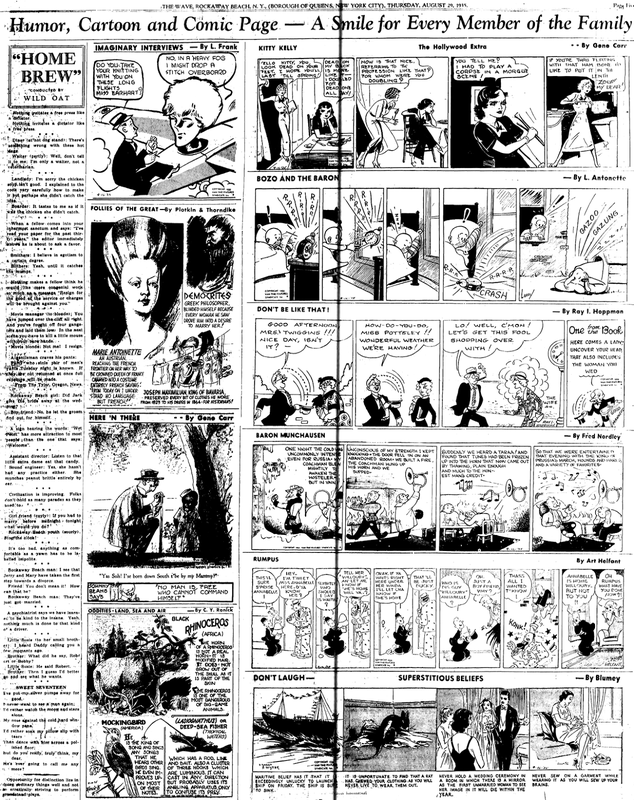 The San Francisco Call published Carr’s Sunday strips Stepbrothers and Mr. Al Most; samples from 1903 to 1912 are here. The 1900 U.S. Federal Census recorded the Carr family of eight in the Bronx, New York at 1275 Union Avenue. Carr’s father worked at the police department. Carr was a newspaper artist. Who’s Who said said Carr married Helen Stilwell, an artist and writer, on August 22, 1906. The Syracuse Herald (New York), July 26, 1908, reported Carr was a murder suspect. Warrant Out for Gene Carr on Murder Charge. Wanted in Connection with Killing of Cameron Cool, Wealthy Horseman. Wife of Illustrator Declares That He Was at Home on Night of the Crime and That Some One Must Have Been Using His Name—Says There Is Some Mistake. New York, July 26.—When the telegram from Chief Long of Wilkes-Barre was received here it was turned over to Detective McKeon. With the telegram came a supposed description of Carr or Vallee, which had him wearing whiskers and heavy eyeglasses. The police were also informed that the man wanted was a cartoonist. Detective McKeon went to the office of the newspaper where the artist named was employed and learned that he was on his vacation, and is living near Red Bank. Nothing further was done when it was found that Carr was out of the city. Gene Carr, a humorist artist on the World, was married a few months ago and removed from his home in the Bronx to Red Bank. N. J. He is a native New Yorker and is only 27 years old. He is clean shaven and seldom wears eye glasses it is said. At Red Bank Mrs. Gene Carr said that her husband had learned that there was a warrant for his arrest and had hurried to New York on the 9:57 train to straighten things out Mrs. Carr said that some one must have been using her husband’s name as he was at home on December 26th last, the date on which Cool was murdered. She said her husband had told her that he never heard of Rosalind Williams, Mrs. Craig or Mrs. Vallee. Mrs. Carr. who was Mrs. Stiltman, a widow when she married the artist, owns a handsome country place in the town of Red Bank. Detective McKeon found Mrs. Craig, late to-night and she accompanied the detective to the World office, where Gene Carr was in company with several detectives. After looking over the group Mrs. Craig declared Carr wasn’t the man. The Wilkes-Barre authorities will be notified. Carr signed his World War I draft card on September 12, 1918. His address was Room 56, Gardens Apartment, Forest Hills, New York. He was a newspaper artist for the New York World. The description said he was of medium height and build with gray eyes and brown hair. The Editor & Publisher, March 4, 1922, reported that Carr’s daughter was studying art. 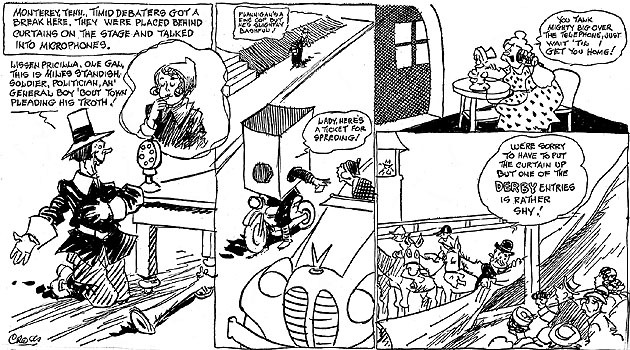 A collection of Carr’s Metropolitan Movies was published as Kid Kartoons in 1922. Carr lived alone, according to the 1930 census, in Manhattan, New York City at 17 West 32nd Street. He was a magazine illustrator. 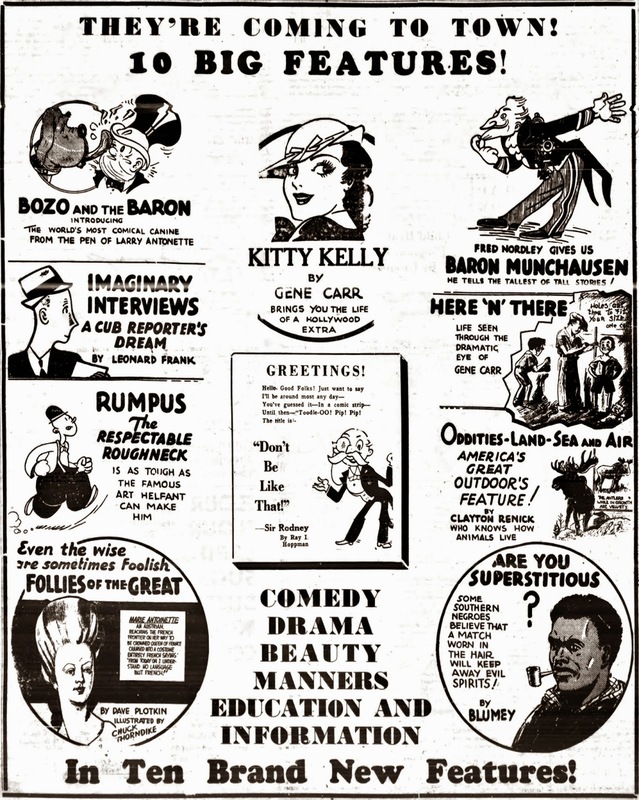 In 1935, Carr created Here ’n There and Kitty Kelly, the Hollywood Extra which were syndicated by Van Tines Features, who also owned the copyright. During its run, Kitty Kelly was re-titled Kitty Kelly and Nellie Shannon. At some point, an artist named “Ro” replaced Carr. At Ancestry.com, the Florida, Divorce Index, 1927-2001 said Carr divorced in 1937 in Palm Beach. The 1940 census recorded Carr in Englewood, New Jersey at 143 Tenafly Road. His second wife was also named Helen; they had a 15-year-old son. Illustrator Carr’s education ended with the eighth grade. Carr’s World War II draft card was signed April 25, 1942. He resided in Englewood, New Jersey at 192 East Linden Avenue. He was self-employed. In the 1950s, Carr resided in Vermont. The 1952 Bellows Falls city directory listing said he lived at 19 Westminster Terrace and worked as an illustrator/cartoonist at 3 Canal. The 1954 directory said his residence number was 29. Carr passed away December 9, 1959, in Walpole, New Hampshire. His death was reported by the Associated Press the following day in the Nashua Telegraph. Walpole, Dec. 10—Gene Carr, 78, cartoonist who created some of the best known humor characters in the early part of the century, died last night after a brief illness. Carr, who never studied art formally, was born in New York and worked for newspapers there and in Philadelphia. He also contributed humor cartoons to national magazines. Among the characters and cartoons he created were “Lady Bountiful,” “All the Comforts of Home,” “The Prodigal Son,” and “Metropolitan Movies” which ran in the old New York World for many years. 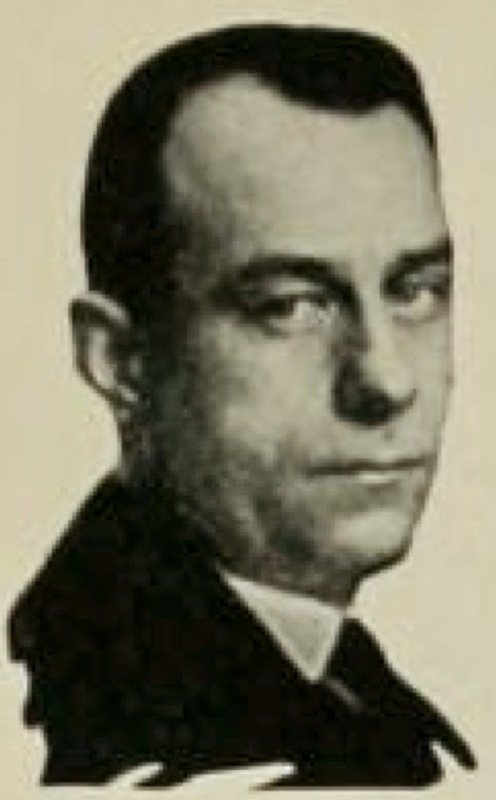 Carr is survived by his second wife, Helen, to whom he was married in 1937, and by a daughter, Cleanthe, of Hollywood, Calif., by his first marriage. Carr was a prolific cartoonist. His comics include Bearville; Reddy – Also Caruso; Mister Al Most; Poor Mister W; Little Darling; Just Humans; and Little Nell. There are few things that succeed in both scaring me and filling me with joy as rediscovering a forgotten newspaper comics syndicate. Joy, I guess, is obvious. A researcher is delighted to make a discovery, of course. But scary? You betcha. 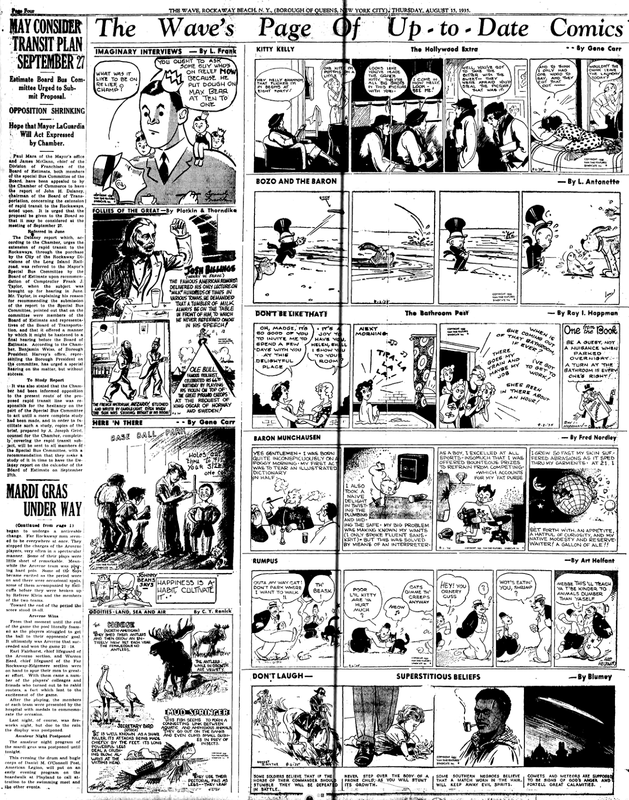 Innocently paging through some weird old obscure paper and suddenly coming upon not just a single unfamiliar comic strip, but a whole bloody page of them makes me feel like I am far away from having a complete grasp on newspaper comics history. One obscure feature, no big deal. But a dozen of 'em? Sheesh. Makes me feel like a rank amateur! 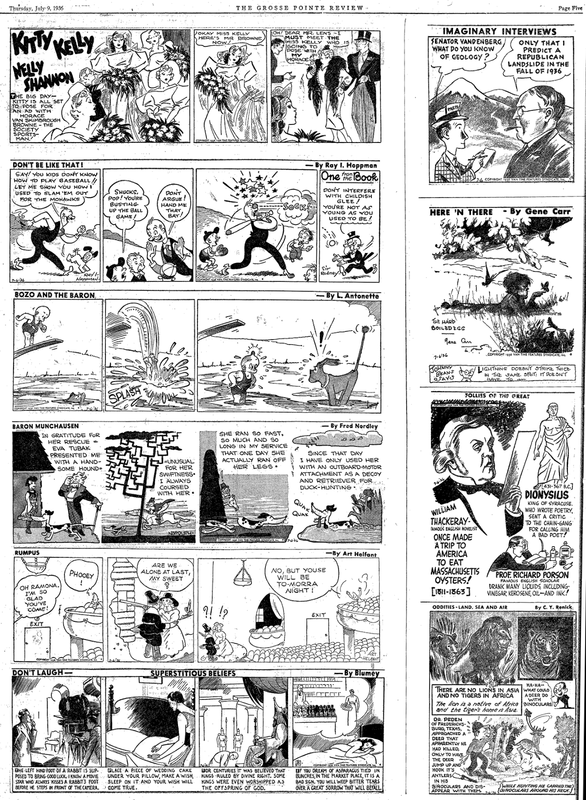 So that was the feeling I got when I first happened upon a page of comics and panels from the very obscure Van Tine Features Syndicate, which discovery happened about ten or so years ago. In the case of finding Van Tine, there was a sense of relief, too, layered on top of it. I had read that there was a newspaper comic strip version of Baron Munchausen and even seen a sample or two of it -- but never in a newspaper. Because Baron Munchausen was done by star golden age comic book artist Klaus Nordling, I'd seen samples in comic book history publications. Of course none of those appearances gave the name of a newspaper where the sample was found (that would make things too easy), but I knew something was probably out there somewhere! A decade or so down the road and I haven't really learned much more about Van Tine. Oh, I've found more newspapers that ran the syndicate's weekly offerings, but I haven't been able to uncover any background information. Who ran this syndicate, and how did it operate? How did they put together their bullpen of cartoonists, and how did the whole operation end up in the dustbin of history? What I can say is that the entire syndicate offering of ten comic strips and panels, plus a puzzle feature or two, had debuted by September 2 1935. I have two different papers for which that is the starting date (as dated on the features themselves -- the papers in one case ran the material late and in one case early). 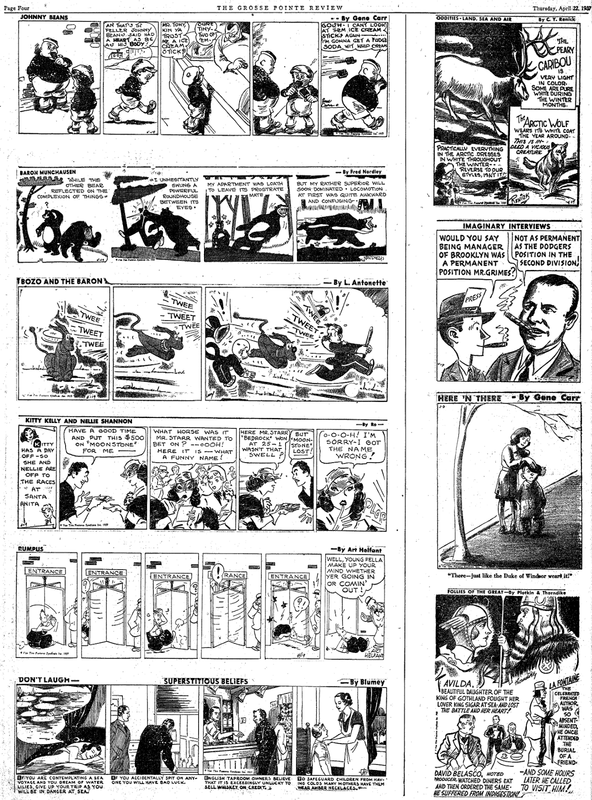 Unfortunately the strips read like second installments, so perhaps the syndicate's first releases were to be August 26. I also know that the syndicate imploded in April of 1937, when almost all of their features started appearing in reruns. I've seen a few of the features running as late as 1939, but I'm certain that has to be newspapers using old stock -- I'm guessing the syndicate itself stopped distributing material shortly after the reprints began. Here are a few other tidbits. Of Mr. (or Mrs.?) Van Tine I know nothing, except that I found some slight indication that it could be A. A. Van Tine -- which doesn't help any in uncovering other information. Also, the syndicate's business offices were on Broadway in New York City. Also, they seem to have been distributed little magazines about advertising in 1937, about the time that the syndicate business was falling apart. The syndicate's offerings were a complete package -- there seems to have been no selling of individual features. The offering was a full comics page, and most subscribers ran it as such without much tinkering. Perhaps the most amazing thing about these offerings is that in the year and a half they ran, the features were all consistent. Nothing was dropped, and there was only one addition. Imaginary Interviews -- celebrity caricature panel by Leonard Frank. Follies of the Great -- Ripley-ish panel with art by Chuck Thorndike, and written by someone bylined Plotkin. 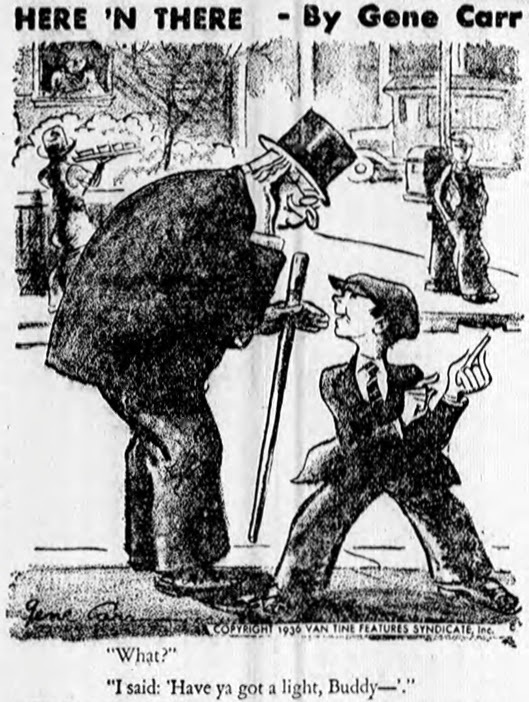 Bozo and the Baron -- a top-hatted kid and a big dog, badly drawn by Larry Antonette; I'm not sure which name in the title goes with which character! 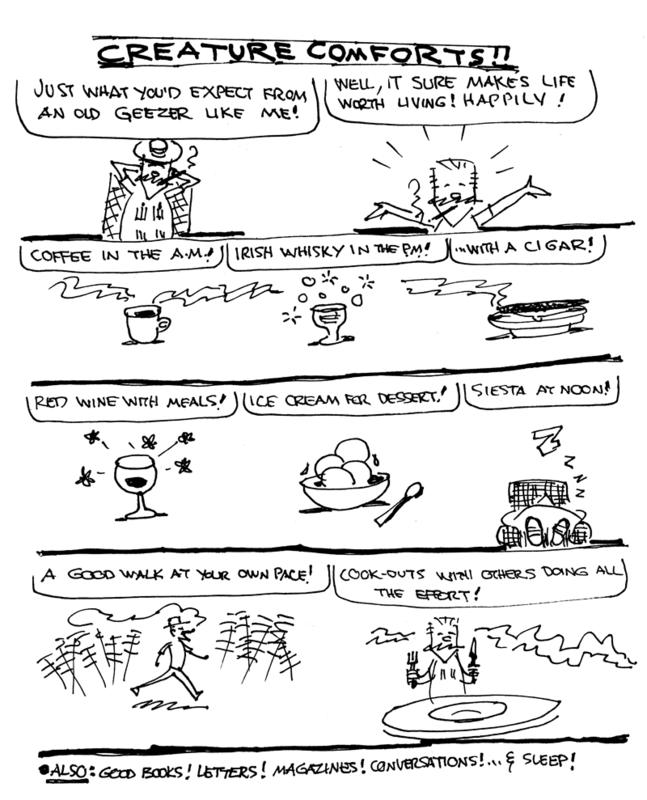 Don't Be Like That -- a strip whose only continuing character was the 'host', Sir Rodney. Very well drawn by Ray I. Hoppman, an old-timer who always seemed to pop up at these fly-by-night syndicates. Baron Munchausen -- from the perspective of history, this Klaus Nordling strip, done under the pseudonym Fred Nordley, should have been the headliner of the bunch. Rumpus -- I've mentioned that Art Helfant sold to every hole in the wall publisher or syndicate he could find, and Van Tine was no exception. 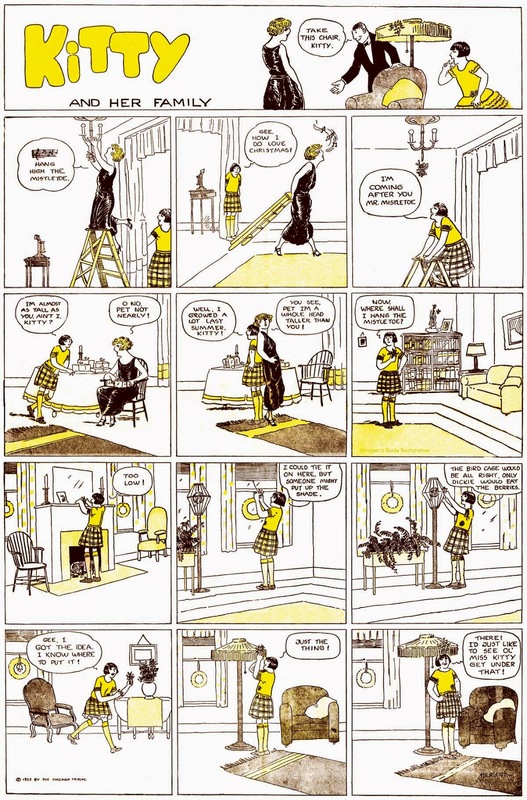 Don't Laugh - Superstitious Beliefs -- A Ripley-esque feature that gives the impression of a strip, but each panel is actually a separate vignette. The author was 'Blumey', who, according to copyright records, was Abraham Blumenfeld. Blumenfeld copyrighted this feature in 1931, so he'd been shopping it around for quite awhile. Art was by someone named Ernest Smythe sometimes, other times by someone who signed themselves with a little symbol that looks like a box with the characters /a in it. Oddities-Land, Sea and Air -- another Ripley copycat, this one with amateurish art by someone named C. Y. Renick. Here 'n There -- pioneering newspaper cartoonist Gene Carr still plugging away here. These look suspiciously like he just put a new title on some of his old Everyday Movies and Just Humans panels of the 1920s. Kitty Kelly (and Nelly Shannon) -- the only Van Tine feature to have an ongoing story, about a pair of would-be models/dancers/actresses. Kitty originally got solitary billing, her gal pal was added to the title on 1/6/36. Gene Carr once again proves that he can draw any type of strip more than passably. However, he jumped ship from this one after 5/25/36, and was replaced by someone who signed themself just 'Ro'. Johnny Beans -- Gene Carr left Kitty Kelly to start this feature about a kid, the only change to the line-up during Van Tine's existence. So there's my brain dump on Van Tine Features. To get any further I guess we'd need the help of someone who is an expert on tracking down these obscure cartoonists. Hey! I know of such a guy! Alex Jay, can you please tell us some more about some of these guys? (You can't hear it through the interwebs, but Alex said yes; he'll be contributing a whole batch of Ink-Slinger Profiles in the coming week or so about these creators. Thanks Alex!!!). Alex Jay sent me this clipping from the Mount Vernon Argus. The small item tells us that that the syndicate did charge for its wares, as opposed to offering them in trade for advertising space (a few syndicates did try the latter model). It also tells us the likely price for the service, $2 per week with a one-year contract. That's very cheap, even for the Great Depression, but then it might have been discounted as the timing here is close to when the syndicate sank out of sight. John Russell Cross was born in Clarksville, Tennessee in 1901. His birth year was found at the World War II Army Enlistment Records at Ancestry.com. His birthplace is based on the residence of his parents, John and Adele, in the 1900 U.S. Federal Census. In the 1910 census, he was the first of three children. Around 1909 his mother remarried to Dr. Roland Macon; the family resided in Clarksville at 610 College Street. The fate of Cross’s father is not known. In 1920, the family remained in Clarksville at 314 North Second Street. Curiously, there was a “John Cross” in Clarksville, who resided at 320 Main Street, about three blocks away. “John Cross” was boarding with Dr. John and Augustine Sladyen, who were the parents of John Russell Cross’s mother. Apparently, he was counted twice in the census. He enrolled at the Chicago Art Institute in the fall of 1921. Artist Everett Gee Jackson wrote about his encounter with Cross in the book, Goat Tails and Doodlebugs: A Journey Toward Art. In the registrar’s office of the Art Institute of Chicago, I found many art students not only paying their fees but also being assigned to rooms in nearby locations in the city. One young man in the line introduced himself to me. I told him my name and that I was from Texas A&M. I said that I was hoping to learn how to draw and paint. Right then we decided to room together. The room assigned to us was on North State Street in an apartment owned by a little black-eyed Irish lady. When she showed us our room, we found that it was on the second floor of a building, right up above the street and above the streetcar track. Every few minutes a streetcar would come grinding by, making so much noise I felt sure we would never be able to go to sleep in that room. But we had already paid a month’s rent in advance, so we decided to try to stay there at least one month. Johnny Cross and I were in several of the same classes at school, one of which was life drawing…. Johnny was wondering what I had in the box. When I opened it, out came the lively monkey. The first thing he did was scamper up to the ceiling of our room, going up the white curtain that hung on each side of our window. I had not even noticed those curtains before. The monkey must have been frightened, for he stayed up there, looking down at us and chattering a long time. I started calling him “Coco,” and I kept begging him to come down. Finally he must have responded to the kindness in my voice, for he descended and jumped upon my shoulder. We became friends. He also became friendly with Johnny, who was as delighted with our new roommate as I was. Cross married in 1926; his wife’s name was Helen. The 1930 Census recorded his occupation as cartoonist at the Tennessean. The couple lived with an aunt, Jennie Lee Waldkirch, and two roomers in Nashville at 2814 Belmont Boulevard. Cartoonists were highlighted in the 1939 book, Tennessee: A Guide to the State, which was produced by Federal Writers’ Project of the Work Projects Administration. Outstanding among Tennessee cartoonists are Carey Orr and Joe Parrish, now of the Chicago Tribune, Tom Little and John Cross, of the Nashville Tennessean, and Jack Knox, of the Memphis Commercial-Appeal. The 1940 census recorded the couple in Linton, Tennessee on Fernvale Road. He was a cartoonist for magazines and newspapers. The 1941 and 1942 editions of Polk’s Nashville City Directory listed “Cross John R 613 1/2 Church R417” under the Advertising Agencies heading. He enlisted in the army on June 20, 1942 at Fort Oglethorpe, Georgia. 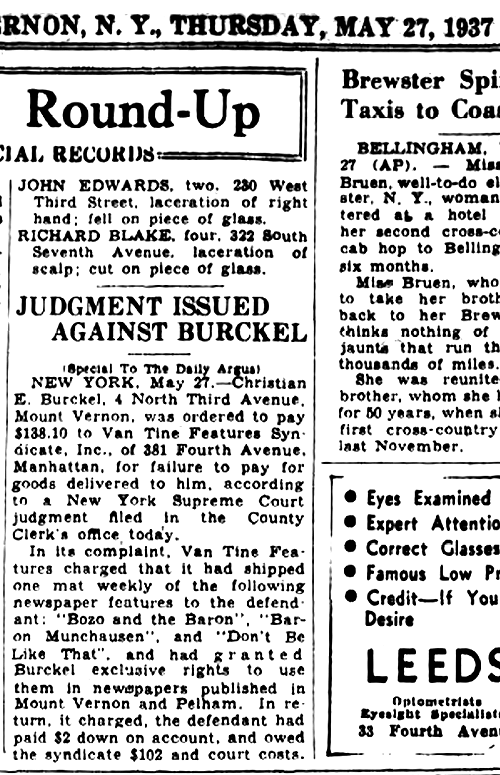 His marital status was “separated, without dependents.” He stood five feet, ten inches and weighed 188 pounds. He produced the daily panel Dippy in October 1947. Two other Cross efforts were Lulu and Cross Sections. Mildred Burleigh only produced two series that we know of, and we covered Pigtails here a short while back. Here, then, is Burleigh's other series, Kitty and her Family. 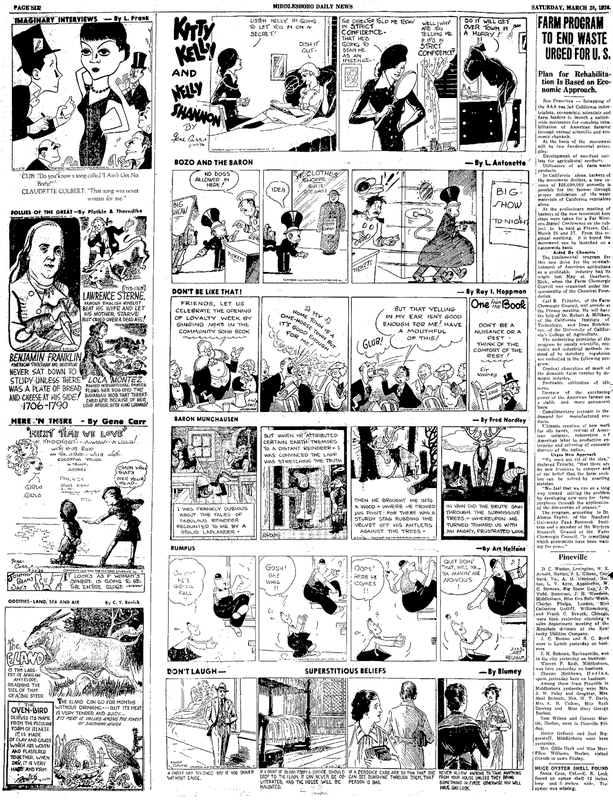 This series, like Pigtails, seems to have been ordered to fill out the offerings of the New York Daily News, but also found its way into parent paper the Chicago Tribune. In the Daily News, Kitty replaced Pigtails starting August 26 1923, and the Tribune added it two weeks later, on September 9. I commented in the prior post that Pigtails was done in a style that mirrored two other Tribune company greats, Clare Briggs and John T. McCutcheon. That influence seems to have fallen by the wayside on Kitty and her Family, but instead of striking out on her own, Burleigh is now copying the cartoonist of The Bungle Family, Harry Tuthill. 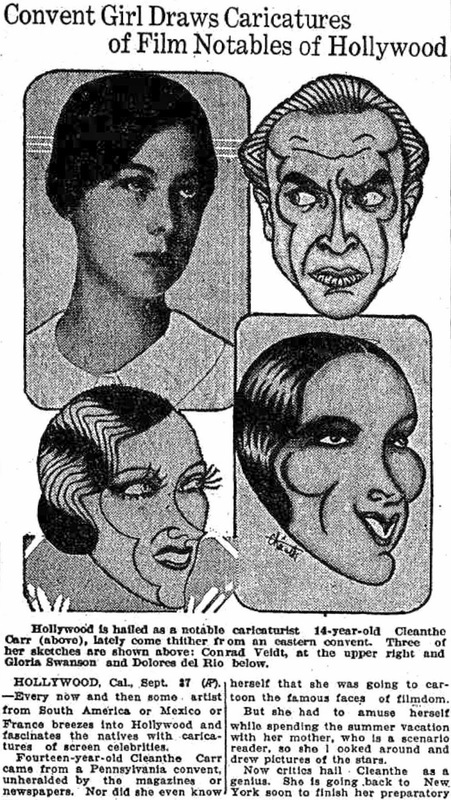 This slice-of-life family strip had nothing special to offer, and I doubt that anyone really missed it after the final installment of the Sunday-only feature ran on February 10 1924. Kind of ineptly drawn, and a lot of filler panels. In fact i think you're all full of cheese. This page really captures something about that ungainly stage of growing up. The kid is wandering around her environment feeling out of proportion to it (every panel contributes) and yet still not big enough to be an adult. it's a lovely piece of work. I'd swap it for the entire set of Connie pages that you've run so far.